Not the monument, but the design of it provides a lot of commotion on social media and the comments are not kind. A monument in memory is well received: a great idea, but why aren't the right people, honoured in the right way? "Fantastic for this group to start something and suddenly realise so many people came to help. That shows how enormous the involvement in Oosterbeek and his surroundings is. Apart from all the candles burning in the dark which is so impressive, the involvement is also very impressive." The group is already looking forward to what a beautiful sight this is going to be. It could be raining this Christmas Eve but they can't be bothered. "Bolsius developed new storm-caps and we expect the candles continue to burn during rain, 48 hours, the whole Christmas!" 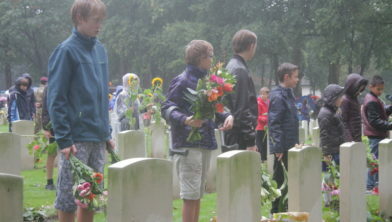 Separate they came, just like countless others, to light candles on the war graves. As all the candles they brought were lit, not every grave had a light burning and some of them had more than one. There should be a light at every grave! They fully agreed on that. But how? Do you want to help? And what age these heroes may have, they are always willing to talk to people and some of them even speak some Dutch!